AWT’s Radar Signal Generators MRS-Series are ideal for radar receiver testing and in training Radar Operators on object detection, recognition and Electronic Warfare (EW). 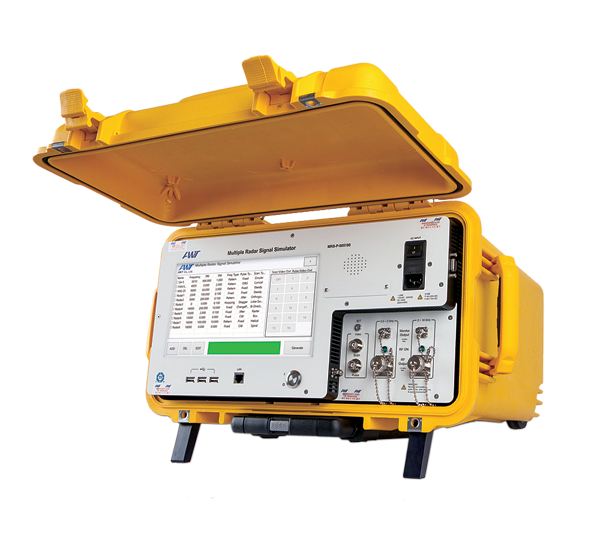 AWT(G) Radar Signal Generators MRS – Series generate a wide variety of Radar Signals. The simulators offer a variety of simulation capabilities; including Radar Warning Receivers (RWR), Missile Warning Receivers (MWR) and other Electronic Warfare (EW) Receivers. AWT’s Radaar Simulator generates CW or Pulsed signals. An intuitve graphical user interface (GUI) makes it easy to program signal parameters. Geographic Information System (GIS) tools are also available (option). Select the model number in the chart below for the datasheet. Video Out : Scan Monitor BNC(f), 3.3VDC Max. Video Out : Pulse Monitor BNC(f), 5VDC Max.